Community Description: This boreal assemblage is characterized by patchy mats of dwarf shrubs among the rocks, with scattered and stunted spruce (usually black spruce). Labrador tea and black crowberry are the most characteristic shrubs. Herbs are very sparse. Foliose and fruticose lichens are often extensive. Back to top. Soil and Site Characteristics: Sites occur near the base of somewhat sheltered or north-facing talus slopes where cold air collects. They are usually steep, though sometimes approaching level. The substrate is large talus blocks with pockets of organic duff among them. Ice blocks may persist into the summer in rock crevices. Back to top. Diagnostics: Sites occupy the base of talus slopes; mats of Labrador tea and other heath shrubs are characteristic, as are abundant fruticose and foliose lichens. Back to top. Similar Types: Spruce Rocky Woodlands lack the abundant Labrador tea characteristic of this community; and also have fewer reindeer lichens. Other spruce woodland types (Spruce - Pine Woodland and Black Spruce Woodland) have higher tree cover (>25%) and lower bryoid cover. Subalpine Hanging Bogs are similar, but have more continuous vegetation, peat accumulation, and occur on upper slopes at higher elevations. Back to top. Conservation, Wildlife and Management Considerations: Known sites are on public lands or private conservation lands. 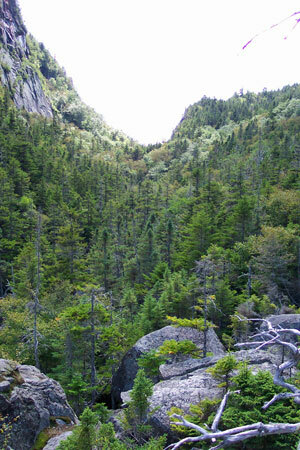 One of the better known sites, Mahoosuc Notch, is traversed by the Appalachian Trail. Heavy foot traffic has caused some damage to the vegetation, but the community remains generally intact. The long-tailed shrew and rock vole may show a preference for these rocky habitats. Back to top. Distribution: Restricted in Maine to northern and montane areas; New England - Adirondack Province extending west and likely northeastward to the Gaspé peninsula. Landscape Pattern: Small Patch. Back to top. There are no documented rare animals associated with this natural community. Mahoosuc Public Land Unit Oxford Co.